Background: In this study, we evaluated the performance of the Baska Mask® , a new extraglottic airway device (EAD) for use in anesthesia in adult patients undergoing a variety of surgical interventions. Materials and Methods: The self-recoiling membrane distally open cuff silicone mask consists of an anatomically curved airway tube with: (1) a bite block over the full length of the airway; (2) a self-sealing membranous variable-pressure cuff which adjusts to the contours of the mouth and pharynx; (3) a large sump cavity with two aspiratable gastric drain tubes; together with a number of special features such as (4) a tab for manually curving the mask to ease insertion; and (5) a suction elbow integral to one port with a second port acting as a free air flow access. The cuff of the Baska Mask® is not an inflatable balloon, but a membrane which inflates on every breath during intermittent positive pressure ventilation (IPPV) to achieve a superior seal when opposed to the larynx. An increase in IPPV pressure increases the oropharyngeal seal. With existing extraglottic airway devices, an increase in IPPV merely increases the leak. Results: Fifty patients with American Society of Anesthesiologists (ASA) physical status I-III were enrolled. We evaluated the "first attempt" and "overall insertion" success rates, insertion time, ease of insertion and removal of the device, oropharyngeal leak pressure, and anatomical position at fiberoptic view. The "first attempt" success rate was high (88%) and "overall insertion" success rates was considered "easy" to "very easy" by the operators in 92% of patients. Removal of the device was considered easy in all cases. The oropharyngeal leak pressure was above 30 cm H 2 O in all patients and the maximum of 40 cm H 2 O was achieved in 82% of the patients. In two patients, no adequate capnogram was obtained, so a smaller size mask was inserted with correction to adequate function. At fiberoptic evaluation of the anatomical position of the masks, the vocal cords could be seen, except in six patients (12%), where only the epiglottis could be visualized. Conclusion: The new EAD Baska Mask® has many novel features which should improve safety when used in both spontaneously breathing and IPPV anesthesia. The introduction of Archie Brain's LMA-Classic® (Intavent TM , Maidenhead UK) into clinical practice in 1988 brought about a revolution in anesthesia. Since then there has been a plethora of new extraglottic airway devices (EADs) on the market. The list of desirable features of EADs is long and it is doubtful whether a single device will ever fulfill them all. After the first-generation EADs, new devices have been designed to increase safety and some have features which might reduce the risk of aspiration. Delayed gastric emptying and aspiration is more pronounced in the pregnant and obese patient. Additional difficulties and hazards are to be anticipated from the use of laryngeal masks in parturients and in pregnant patients, especially if they are also morbidly obese. The Baska Mask® ([Table 1]; [Figure 1],[Figure 2] and [Figure 3]; PROACT Medical Systems, Frenchs Forest NSW, Australia), designed by Australian anesthetists Kanag and Meena Baska, is a new CE--approved and internationally patented EAD, provided in single use and multi-use versions. The Baska® mask obviates the need for an orogastric tube and replaces this with a sump and two drains. The Baska® mask brings together features of: (1) the LMA-ProSeal® (Laryngeal Mask Company, Singapore), i.e. 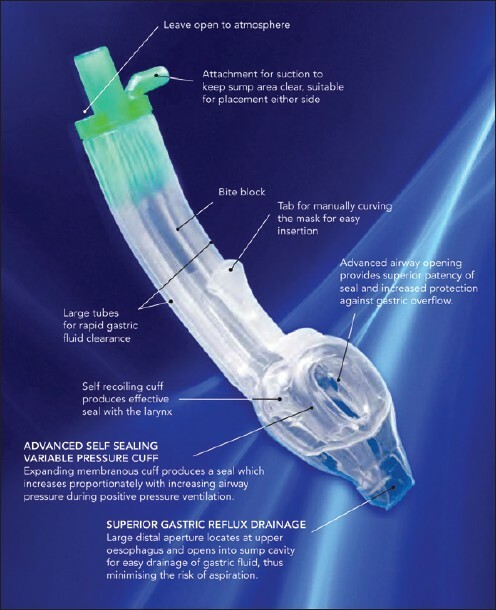 high seal pressure, gastric access port and bite block, which facilitate ventilation, provide airway protection, and minimize airway obstruction, respectively; (2) the LMA-Supreme® (Laryngeal Mask Company, Singapore), i.e. oval shaped, anatomically curved airway tube which incorporates a gastric drain tube; (3) the i-gel® (Intersurgical®, Wockingham, Berkshire, UK), i.e. a gel-like cuff instead of an inflatable balloon; and (4) the Slipa® (Slipa Medical Ltd®, Douglas, Isle of Man), i.e. a cuffless, anatomically pre-shaped sealer with a sump reservoir. The last three have an incorporated bite block to protect the airway. The Baska Mask® presents with a bite block throughout the entire length of the airway tube. The oval-shaped airway tube matches the shape of the mouth and reduces rotation within the pharynx. The Baska Mask® also features a number of unique improvements: (1) a self-sealing membranous, variable-pressure, non-inflatable, recoiling cuff made of medical grade silicone, designed in such a way that during IPPV, the seal apposes to the glottis incrementally to augment seal pressure with increasing airway pressure; (2) a gastric reflux high flow suction clearance system consisting of (a) a large distal aperture located at the upper end of the esophagus, which (b) opens into a sump cavity integral to and behind the mask, and (c) is aspirated using two cylindrical tube vents running the entire length of the main stem of the device, one on each side of the main airway tube, both of which open distally into the sump cavity. One of these tube vents is connected to high pressure, high flow suction, while the other is left open to ambient to equilibrate the pressure in the sump cavity to atmospheric. This system allows for rapid clearance of gastric fluids or secretions that may collect in the sump during maintenance and emergence from anesthesia; (3) a tab for manually curving the mask to facilitate insertion; (4) a 90° suction elbow, i.e. an extra connector for attaching suction to the proximal end of whichever of the two ports is used to keep the sump area clear (the other must be left open to atmosphere and not occluded or obstructed in any way). The Baska Mask®, an Australian designed and manufactured device, is made entirely from medical grade silicone, except for the 15 mm connector, which fits into the proximal ends of the main (ventilation/breathing) airway tube and clearance tubes, and an interchangeable (left or right) swivel suction elbow, attached to either of the suction/air inflow ports. We conducted a pilot study in 50 patients, to determine whether the salient features and improvements incorporated in the Baska Mask® provide a clinically useful EAD which increases the safety and improves the efficacy of airway management for patients undergoing surgery. The EAD Baska Mask® is a CE-approved device. Fifty consecutive patients (American Society of Anesthesiology physical status grade I-III, aged 18-80 years) were selected, from a population of elective surgery patients, for this study. A variety of surgical interventions (general surgery, gynecology, orthopedics, urology, and plastic surgery), not requiring endotracheal intubation, received a single-use Baska Mask® for anesthesia. Patients were excluded from the trial if they had a known or predicted difficult airway, a mouth opening of <2.5 cm, were at increased risk of aspiration of gastric contents, required surgery in the non-supine position, or were undergoing head and neck surgery. The pre-anesthetic visit of the patient, performed by a number of anesthetists not involved in this study, ascertained their history of difficult intubation, measured the common predictive indices for difficult intubation (BMI, thyromental distance, Mallampati grade, inter-incisor distance), and evaluated their dentition and neck movement. After removal from its sterile packet, the integrity and function of the Baska Mask® was checked by occluding the airway opening of the proximal connector end with one thumb, holding the mask head with the other hand and placing the other thumb over the airway opening of the mask to seal. Pressure was applied for 5 s using a reservoir-bag squeeze to confirm the absence of leak in the device. The entire body of the mask was then lubricated with a water-based lidocaine (lignocaine) gel. Size selection was based on the manufacturer's recommendation of weight-based estimate plus clinical judgment. At present, the Baska Mask® is available in four sizes: size three (30 to 50 kg), size four (50 to 70 kg), size five (70 to 100 kg), and size six (over 100 kg). The membranous cuff of the Baska Mask® has a width of 5.5, 6.0, and 6.5 cm for the respective sizes four, five, and six, while the width of the airway tube is respectively 3.5, 4, and 4 cm. No size 3 Baska Masks were used in this study. The membranous cuff of the Baska Mask® appears bulkier than the equivalent inflatable cuff on cuffed laryngeal masks. The mask can easily be decreased in size during insertion by compressing the proximal, firmer (though still easily compressible) part of the mask below the airway tube, between the thumb and two fingers. The entire mask needs to be lubricated before insertion into the mouth, otherwise the bulk of the mask "cuff" may produce resistance as it traverses the hypopharynx. During insertion, the mask is pushed past the front teeth towards the hard palate, avoiding the tongue. If necessary, when the mask is fully within the mouth, the tab, a unique feature of the Baska Mask®, is used to help negotiate the palato-pharyngeal curve. A standard anesthesia sequence was followed. Upon arrival in theatre, the patients were connected to standard monitoring devices. Anesthesia was induced in the supine position with the patient's head in the neutral position, resting on a pillow about 8 cm in height. Induction of anesthesia was achieved using Fentanyl 1 μg/kg and propofol 2.5 mg/kg. Anesthesia was considered adequate for device insertion when the patient was unresponsive, had lost the eyelash reflex, and did not respond to anterior jaw thrust. If coughing, gagging, or body movement occurred during insertion, bolus doses of propofol 0.5 mg/ kg were given to achieve an adequate depth of anesthesia. Anesthesia was maintained using sevoflurane 1.5-2.0% in oxygen 40% in air. Prior to insertion of the EAD, the lungs were manually inflated using a face mask and sevoflurane in oxygen. All EADs were inserted in strict accordance with the manufacturer's recommendations, by only two experienced anesthetists, who had used the Baska Mask® prior to this clinical study - first in manikins and, later, in 30 "pilot" patients. With the mouth open, the proximal, firmer part of the mask was compressed between thumb and two fingers and the mask was pushed past the front teeth towards the hard palate, avoiding the tongue. The tab was used only if required to help negotiate the palato-pharyngeal curve and, when the mask was fully within the mouth, the tab was released as soon as the tip of the mask passed around the curve. The mask was then advanced until resistance was encountered, at which point the tip of the mask was engaged into the upper end of the esophagus. At this stage, the patient's front teeth were opposite to the reinforced part of the tube into which the connectors are bonded. The patency of the airway was ascertained and the Baska Mask® was connected to the breathing circuit and fixed in place with adhesive tape. An initial assessment of airway patency and the ability to ventilate the lungs was made by gently squeezing the reservoir bag, whilst "fine tune" adjusting the device and observing the amplitude of end-tidal carbon dioxide waveforms and the presence of chest movement. The patient was either left breathing spontaneously or ventilated using IPPV, at the discretion of the anesthetist. Analgesia was obtained with additional intermittent boluses of iv fentanyl as required and infiltration of the surgical wound with local anesthetic. 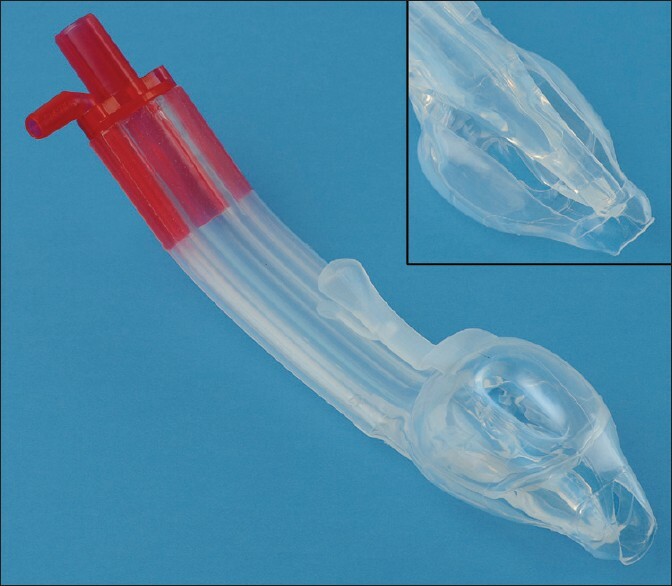 A clear airway was defined as SpO2 >95%, ETCO2 <50 mmHg and tidal volumes >6 ml/kg.One of the clearance channels was connected to the suction apparatus via the suction elbow (supplied in the packaging) and suction was applied either continuously or intermittently as required. The other channel was left open to atmosphere. If necessary, a lubricated orogastric tube (size 4: 14 Fr. ; size 5 and 6: 16 Fr.) can be inserted simultaneously via one of the gastric channels into the stomach. We must ensure that an anesthetist does not do both (aspirate via one port, and insert an orogastric tube via the second port) at the same time. At the end of surgery, the anesthetic gas mixture was replaced with 100% oxygen to facilitate patient recovery. The Baska Mask® was removed when protective reflexes returned to normal. The following parameters were recorded for each patient: gender, age, height, body weight, BMI, ASA class, adequacy of neck movement, Mallampati score, thyromental and interincisor/interdental distance, status of dentition, type of operation, and duration of anesthesia. The following assessments were made: (1) The success of insertion was assessed by the number of insertion attempts (counted as an attempt when the EAD is taken in and out of the mouth); (2) and the ease of insertion (very easy, easy, difficult, very difficult); (3) the insertion time (the time between picking-up the prepared mask and successful placement); (4) the effective airway time (time between picking-up the prepared mask and obtaining the first capnograph trace); (5) The anatomical position of the Baska Mask® in situ was assessed clinically (by observing that the midline of the device remained in the anatomical midline) and by fiberoptic evaluation (3.7 mm bronchoscope, Karl Storz TM , Tuttlingen, Germany) through the airway tube of the device, using the Brimacombe scoring system [Table 2] based on the visualization of the vocal cords and/or the epiglottis;  (6) Oropharyngeal leak pressure was determined immediately following mask insertion and at 30 min of surgery by closing the expiratory valve of the circle system at a fixed gas flow of 3 L/min and noting the airway pressure (max allowed was 40 cm H 2 O) at which equilibrium was reached; (7) ease of removal of the device (very easy, easy, difficult, very difficult); (8) whether following extubation, the patient was (a) coughing, there was (b) blood staining on the device, or (c) trauma to lips, tongue, and teeth, (d) whether the sump clearance was adequate or not (i.e. whether the sump was clear of mucous and gastric contents, and (e) whether or not there was gastric fluid in the airway cavity; and (8) postoperative airway morbidity sore throat, dysphagia, dysphonia graded as none, mild, moderate, or severe, at 2 h in the postoperative recovery room (evaluated by a trained assistant, not involved in the study). Intra-operative complications were recorded as well as any intervention required to correct the use of the EAD. At the time of removal of the mask, its shape and integrity were checked thoroughly. If two different sizes of the Baska Mask® had to be used, only the results of the second (functional) mask were included in the study. If two Baska masks were used and still an adequate capnogram was not obtained, the normal in-hospital protocol was followed. Subsequently, the patient was excluded from further study. 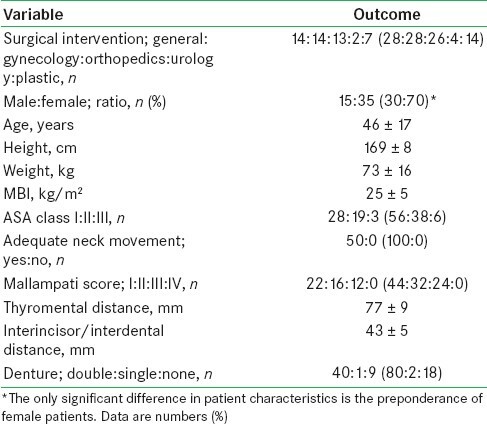 Demographic data [Table 3] and anesthetic characteristics [Table 4] are shown for the 50 patients who were included in this study and who underwent surgery without untoward results. The Baska Mask® was studied in a variety of surgical patients although more females were recruited than male patients. The first attempt to successfully insert a Baska Mask® was high (88% of the patients). Five patients (10%) needed a second attempt and one patient (2%) a third attempt. Insertion was considered very easy in 36 patients (72%), easy in 13 patients (26%), and difficult in 1 patient (2%). Insertion time and effective airway time were respectively 16 ± 6 and 32 ± 12 seconds. In all patients needing an orogastric tube (OGT), it was easy to insert an OGT through one of the gastric drain tubes. The other gastric drain tube was used to connect the suction elbow to the vacuum system in those where an orogastric tube was not used. In most situations, an OGT was not needed. 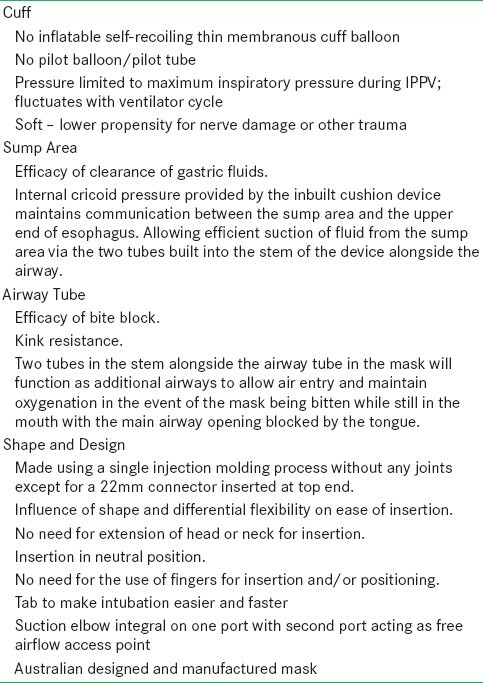 The sump drain connection worked adequately and no gastric fluid in the airway cavity was detected in any of the patients at the time of the removal of the device. Clinical assessment of the "device midline" corresponded to the "anatomical midline" position in all patients. The epiglottis could be seen fiberoptically in all patients through the membranous cuff [Table 2]. 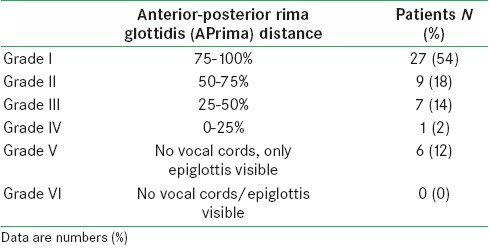 In 27 patients (54%), a perfect or near-perfect view (grade I) could be obtained of the full anterior-posterior rima glottides distance, while in another group of 9 patients (18%), more than 50% of the vocal cords (grade II) could be clearly seen. In seven patients, 25% to 50% of the vocal cords (grade III) could be seen; while, in six patients (12%) only the epiglottis (grade V) could be visualized. In one patient (2%) a grade IV view (0-25% of the vocal cords) was obtained. None of the patients had a grade VI (no vocal cords/epiglottis visible) view. Sometimes, the distal part of the Baska Mask® was seen, using the fiberoptic scope as plastic wrinkles around the epiglottis [Figure 4] although this had no influence on airway patency or anesthetic outcome. The oropharyngeal leak pressure was above 30 cm H 2 O in all patients. In fact, in 38 (76%) of the patients at the time of insertion of the mask and in 41 (82%) of the patients at 30 min following insertion, the leak pressure reached the maximum tested, i.e. 40 cm H 2 O. In five patients, a small leak was detected, but did not create any clinical problem. In two patients, a smaller size Baska Mask® was used (size 4 instead of size 5) because of leakage and difficulties obtaining a normal, sustained capnogram trace waveform. The results from the second mask insertion were incorporated in the study. The majority of the patients, i.e. 36 (72%) breathed spontaneously, while the others were temporarily ventilated mechanically. The mean maximum CO 2 measured was 5.7 ± 0.7 volume %, and the mean duration of anesthesia was 58 ± 32 min. On no occasion did we experience desaturation of <95%. At the end of surgery, the Baska Mask® could be removed easily without problem in all patients. None of the masks lost their integrity or shape. Coughing during extubation was seen in two patients, blood staining on the device in four patients, and trauma to the lip in one patient. Airway morbidity, measured in the recovery room two hours postoperatively, revealed minor sore throat in five patients and dysphagia in one patient. The list of intra-operative complications was small and insignificant. This is the first publication evaluating the Baska Mask® clinically. An early pilot study showed that the new device can be used successfully during anesthesia for a large variety of surgical interventions. Performance data suggests that it is feasible to obtain adequate or good outcomes in the overall majority of adult patients, with a high first attempt success rate (88%), easy insertion rate (92%), short insertion time (16 s), and fast effective airway time (32 s). All patients studied with the Baska Mask® were included in the study. No patient had to be converted to another EAD. Only minimal blood-staining and postoperative sore throat were recorded as minor complications. No concrete conclusions can be drawn about the true incidence of complications due to the small numbers involved and variable duration of surgery. Both spontaneous respiration and positive pressure ventilation are possible with the Baska Mask®. In this study, we used only single-use Baska Masks® but the manufacturer (PROACT Medical Systems, Frenchs Forest NSW, Australia) also provides multi-use versions, which can be used up to 70 times. In two patients, a smaller size Baska Mask® had to be used. This finding warrants a careful re- evaluation of the sizing based upon weight. If there is any leak around the cuff, the gas escapes easily via the sump drain system without distending the mouth and oropharynx. The vent (clearance tube) should never be blocked and must remain open to atmosphere at all times, e.g. n OGT must not be left in one port, while the contralateral port is being aspirated. The oval airway tube is anatomically shaped and curved to match the shape of the hypopharynx and mouth, to prevent rotation. The whole length of the airway tube incorporates a bite block and two "clearance" gastric drain tubes, all features of a third-generation EAD. If regurgitation is anticipated or is seen as at high risk of occurrence, suction should be connected to the suction port of the device before insertion and be left running continuously until the mask has been positioned correctly. Suction should also run continuously during removal of the device at the end of the procedure. Maintaining high pressure suction continuously throughout the procedure is not recommended as it could predispose to post-operative sore throat due to the drying action of the air flow. An advantage of the dual gastric drain tube is that one drain tube can be used to apply low pressure suction all the times. The other gastric drain tube serves as (1) a free air vent and (2) a guide for an OGT, which can be used to empty the stomach. Aspiration of gastric content through the OGT verifies the correct position of the gastric tube. OGT insertion is not recommended during suctioning as it may block free air flow creating negative pressure in the sump area. Full high pressure suction should be applied to the suction outlet of the device at the time of removal of the device, clearing the airway of any fluids or secretions. Further suctioning with a Yankauer Sucker is not necessary. If the patient is receiving mechanical ventilation and needs to have an OGT, it may be easier to remove the connector. Enough room is available, even beside a bulky bacterial filter, to insert the OGT down the gastric drain tube into the esophagus and stomach. Lubrication of the OGT further eases insertion. The Baska Mask® looks larger than standard first-generation laryngeal mask airways (size four: width cuff 5.5 cm; width airway tube 3.5 cm). The respective width of the cuff and airway tube for a size four EAD are 6 cm and 2.5 cm for the LMA-ProSeal®, 5 cm and 4 cm for the i-gel®, and 5.5 and 2.5 cm for the LMA-Supreme®. Contrary to other EADs, the Baska Mask® "cuff" can easily be decreased in size by compressing the proximal, firmer part of the mask between thumb and fingers, making insertion easier. Inspection at the time of removal of the device showed retention of full integrity and shape of all masks. The suction elbow can easily be disconnected. Most EADs which depend upon an inflated cuff to maintain a seal, pose potential hazards as the cuff pressure may be either too high or too low. Over-inflation may cause airway trauma, while under- inflation may result in airway leak and potential aspiration of gastric content. With the Baska Mask®, neither cuff deflation prior to insertion, nor cuff inflation, nor the use of a cuff pressure measurement device, nor monitoring of cuff pressure during the surgical intervention, is required. The cuff of the Baska Mask® does not rely on inflation of a cushion or balloon to retain its shape or maintain a seal during use. The seal depends on the flexible membrane adapting to the patient's laryngopharynx. The pressure generated on the ventilator reflects the airway pressure, which is also the cuff pressure. As there is no inflated cuff in the Baska Mask®, neither should it cause tissue or nerve damage , nor should the intracuff pressure need monitoring. Indeed, there is no separate inflated balloon type cuff to monitor. Fiberoptic evaluation of the anatomic position of the Baska Mask® in situ [Figure 4] revealed that, in half of the patients studied (54%), a perfect or near-perfect position of the vocal cords could be obtained. In 12% of the patients only the epiglottis was visible. This is comparable to other EADs. , Occasionally, the soft, membranous part of the cuff is wrinkled around the epiglottis although it did not interfere with airway patency or anesthetic outcome. This study has some limitations, probably the most important being that it is observational and has no controls in the design of the study. The fact that it reports the experience of two operators reduces the generalizability of our findings. Further evaluation needs to be done in the pregnant and obese adult population and in children. 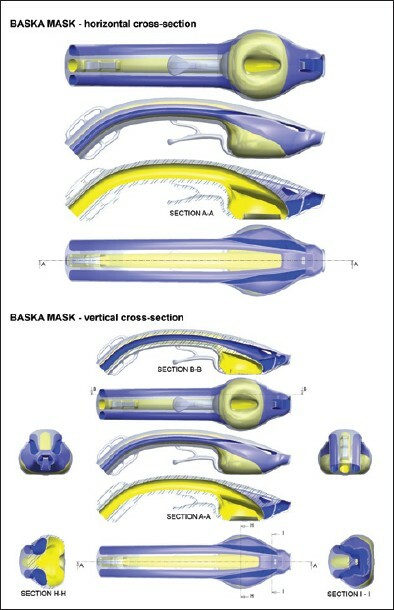 The Baska Mask® is another step forward in the search for an ideal extraglottic airway device, which incorporates an airway tube, a tab to help negotiate the palato-pharyngeal curve, two large tubes entering the sump area for high suction clearance of the sump, a large sump reservoir to collect any fluid entering the pharynx, a bite block over the full length of the airway tube, an oval, anatomically- curved airway tube and a non-inflatable silicone mask (which adjusts to the contours of the mouth and pharynx, bringing the aperture of the mask towards the glottic entrance). Further clinical studies need to determine the exact place of the Baska Mask® for routine use in anesthesia. The tested Baska masks used in this study were provided by ProAct Medical systems, Sydney, Australia, free of charge. 1. Brain AI. The laryngeal mask - A new concept in airway management. Br J Anaesth 1983;55:801-5. 2. Brimcombe J, Berry A. A proposed fiber-optic scoring system to standardize the assessment of laryngeal mask airway position. Anesth Analg 1993;76:457. 3. Keller C, Brimacombe J. Mucosal pressure and oropharyngeal leak pressure with the ProSeal versus laryngeal mask airway in anaesthetized paralysed patients Br J Anaesth 2000;85:262-6. 4. Keller C, Brimacombe J, Moriggl B, Lirk P, von Goedecke A. In cadavers, directly measured mucosal pressures are similar for the Unique and the Soft Seal laryngeal mask airway devices Can J Anaesth 2004;51:834-7. 5. Eschertzhuber S, Brimacombe J, Hohlrieder M, Keller C. The laryngeal mask airway Supreme-a single use laryngeal mask airway with an oesophageal vent. A randomised, cross-over study with the laryngeal mask airway ProSeal in paralysed, anaesthetised patients Anaesthesia 2009;64:79-83. 6. Hosten T, Gurkan Y, Ozdamar D, Tekin M, Toker K, Solak M. A new supraglottic airway device: LMA-supreme, comparison with LMA-Proseal. Acta Anaesthesiol Scand 2009;53:852-7. 7. Theiler LG, Kleine-Brueggeney M, Kaiser D, Urwyler N, Luyet C, Vogt A, et al. Crossover comparison of the laryngeal mask supreme and the i-gel in simulated difficult airway scenario in anesthetized patients. Anesthesiology 2009;111:55-62. 8. Cook TM, Gatward JJ, Handel J, Hardy R, Thompson C, Srivastava R, et al. Evaluation of the LMA Supreme in 100 non-paralysed patients. Anaesthesia 2009;64:555-62. 9. Chew EF, Hashim NH, Wang CY. Randomised comparison of the LMA Supreme® with the i-gel® in spontaneously breathing anaesthetised adult patients. Anaesth Intensive Care 2010;38:1018-22. 10. Francksen H, Renner J, Hanss R, Scholz J, Doerges V, Bein B. A comparison of the i-gel with the LMA-Unique in non-paralysed anaesthetised adult patients. Anaesthesia 2009;64:1118-24. 11. Gatward JJ, Cook T-M, Seller C, Handel J, Simpson T, Vanek V, Kelly F. Evaluation of the size 4 i-gel airway in one hundred non-paralysed patients. Anaesthesia 2008;63:1124-30. 12. Janakiraman C, Chethan DB, Wilkes AR, Stacey MR, Goodwin N. A randomised crossover trial comparing the i-gel supraglottic airway and classic laryngeal mask airway. Anaesthesia 2009;64:674-8. 13. Van Zundert A, Brimacombe J, Kamphuis R, Haanschoten M. The anatomical position of three extraglottic airway devices in patients with clear airways. Anaesthesia 2006;61:891-5. 5 Third generation supraglottic airways: is a new classification needed?